Tween and Teen fiction readers deserve honest, compelling and engaging stories. They don't want to be pandered to any more than discerning adult fiction readers. Tween and Teen fiction readers are a particular breed of readers. They have just enough life experience to know realities of struggle or worry and yet ought to know that life really does offer hope and resolution. The Green Coat: A Tale from the Dust Bowl Years by Rosemary McDunn is deservedly one of the most popular tween and teen fiction books in homes and classrooms. 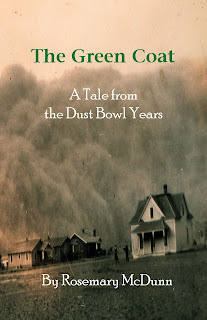 Available in paperback and kindle, The Green Coat offers a story of hardship and hope in the midst of one of the greatest struggles in American history: the dust bowl. The Green Coat's tale of perseverance is one that readers of all ages enjoy.